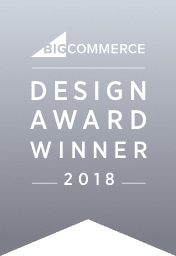 We’re thrilled to announce the website we built for Cruisemaster was named People’s Choice winner of the 2018 BigCommerce Design Awards! Out of over 600 BigCommerce stores who entered and 22 finalists, we are so proud to have been chosen by voters to win the People’s Choice award. “This site is quite complex, with a lot of moving parts and the customer wanted a much more information focussed product page. We also had a timeframe of only 5 weeks for completion. To see our work on CruiseMaster click here.